Consolidated sleep, whereby one sleep bout (e.g. seven to eight hours) at night is obtained during a 24-hour cycle, is preferable particularly for maintaining alertness during the day. 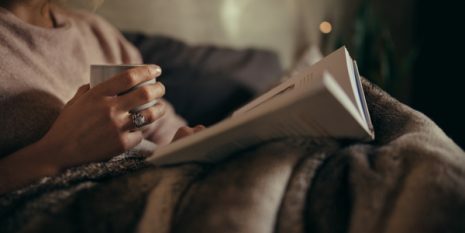 To help you get a good night’s sleep, it is important that you sleep in an environment that is noise free, cool and dark (see our tips in Sleep Well in Seattle 1 on when to catch and avoid light). Research has shown that wearing blue-blocking glasses before bed time increases sleep duration, reported sleep quality and the production of melatonin by 58%, a hormone that tells the body it is time to sleep (Ostrin, Abbott, & Queener, 2017). Despite making your environment more conducive to sleep, sleep deprivation (e.g. only managing 5 hours of sleep) is common particularly following eastward travel due to attempting sleep during the biological day (day in the home time zone) in order to shift sleep to an earlier time. Firstly, to facilitate falling asleep following eastward travel, it may be useful to coincide bed-time with the dip in the alertness rhythm during mid-afternoon in the home time zone (siesta time or after-lunch dip), when you naturally feel more sleepy. Research has also shown that split sleep (two or three bouts of sleep in 24 hours) can have beneficial effects on performance in terms of maintaining attention levels particularly if at least 4 hours of sleep occur during the biological night (home time zone). To keep alert during the day, particularly for the conference, use a combination of napping and caffeine to help you get through the day. Bright light also helps by suppressing melatonin and boosting mood and alertness. A power nap (no longer than 30 minutes) can help you with feeling more alert and focused. Furthermore, a power nap is not associated with the feeling of grogginess when you wake up which occurs after longer sleep times. Why not try out our EnergyPod at stand #28 to help you feel refreshed and concentrate on the talks you are interested in at the conference? 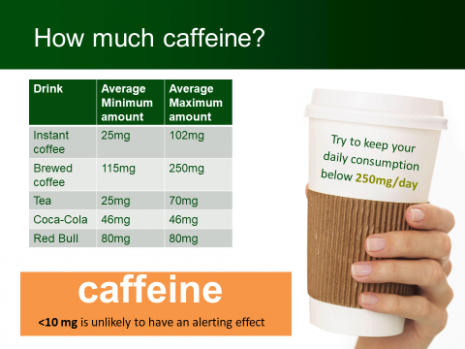 Caffeine can be used strategically to promote alertness and stay up longer when required (e.g. westward travel). Less than 10 mg of caffeine is unlikely to have an alerting effect and a cup of filter coffee has on average 90 mg of caffeine. However, the ability of caffeine to keep you alert depends on your tolerance and it is recommended that you don’t exceed a daily consumption of 250 mg per day. Furthermore, be mindful that caffeine alerting effects can last for 4 hours or longer so avoid it close to bedtime. Below is a table showing the average amount of caffeine in common drinks. Extra advice and practical help will be on hand from Research Director, Dr Alexandra Holmes at the Clockwork/Baines Simmons stand #28. Ostrin, L. A., Abbott, K. S., & Queener, H. M. (2017). Attenuation of short wavelengths alters sleep and the ip RGC pupil response. Ophthalmic and Physiological Optics, 37(4), 440-450.